Saturday afternoon at WordCamp Chicago, I spent an hour listening to Trafton Esler review hosting options for WordPress. Now, to be clear, Trafton works for wpEngine – my favorite of the managed WordPress hosting providers (but they’re all great). But that didn’t make his presentation biased or one-sided. In fact, some of his material was developed with the founder of ZippyKid, if I’m not mistaken. Like I said, these weren’t his exact words, but that’s how I understand his material. I’m sure he’ll post his slides somewhere and you can review them for yourself. My sense is that if you really value cost, you should just keep your site on WordPress.com – and never look at Shared Hosting. That’s right, I said it. I’ve been known to have an opinion (now and then). And I know that a lot of folks in the community re-sell shared hosting and make good money at it. I also know that not all shared hosting is the same. So I don’t want to toss the baby out with the bathwater. When I first started hosting sites I remember starting (because of what we were building at the time) with dedicated solutions that were really expensive. 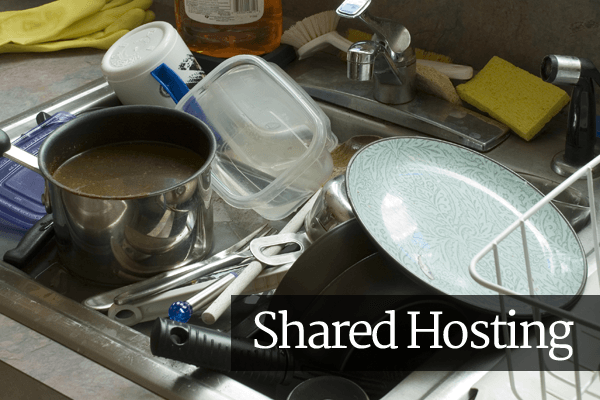 Eventually I found shared hosting and fell in love – because it was so cheap. But the marketing on the web sites made it sound like I was sharing a server with 10 other clients just like me. You can imagine my surprise when I logged into the server and had to navigate to my “home” folder. There were hundreds of other folders on the server. No wonder performance was bad. Do you remember your college days? Roommates? Remember the ones that wouldn’t wash their dishes? I had a roommate like that once and I moved all his dirty dishes and pots and pans to his bed so he’d remember to wash them! Oh yes! I wasn’t happy. But you know what? I wasn’t the best roommate either. I did things without thinking. Didn’t you? And that’s what happens when you share your server with 900 other folks. Their mistakes impact you. They install plugins that tax the server’s resources or database. And you end up with a slow server because of it. Quick choices cost you later. Shared hosting is cheap now, but will cost you later when you have to fix things on your own (or pay someone to do it). Drama & Blame. Did you have one of those roommates that always blamed you. Go ahead and call your shared host. They’ll tell you it’s someone else’s fault (yours).